The MR340 is nearly four days long. In fact, assuming I do it in 70 to 80 hours, it is almost exactly half a week spent either in a boat or getting ready to be in a boat. I know it will be strenous, and I know it will be mentally taxing, but mostly I know it will be long. So, given the opportunity to spend two solid days on the water preparing my body and mind, I looked at the weather report and threw my stuff together. My plan initially was to put as many miles behind me as I possibly could. Just keep paddling, and when it gets dark find a quiet place to camp, and when the sun comes up paddle some more. I wasn’t going to put in any 18 hour days and four hour nights, but I knew being outside for that length of time would allow me to answer a number of questions. How should I pack my gear? Is the layout of my boat correct, or do I need to change anything? How will my hands hold up without gloves? What kind of food should I take? Am I physically ready? Sometimes our experiences give us more than answers to questions we already have. Sometimes they provide us us with more questions. Ones we didn’t even know we needed to ask. Question: What am I doing? Obviously, I spent more more than just the past few days asking myself this. I think about it almost every time I paddle. What would compel a person to prepare for a challenge? I basically was saying “I am going to be miserable for four days, and in order to get ready for that I need to make myself as miserable as often, and for as long as possible.” Now, that’s overstating it a bit, but you get the idea. About a third of the way through the first day I found one answer. 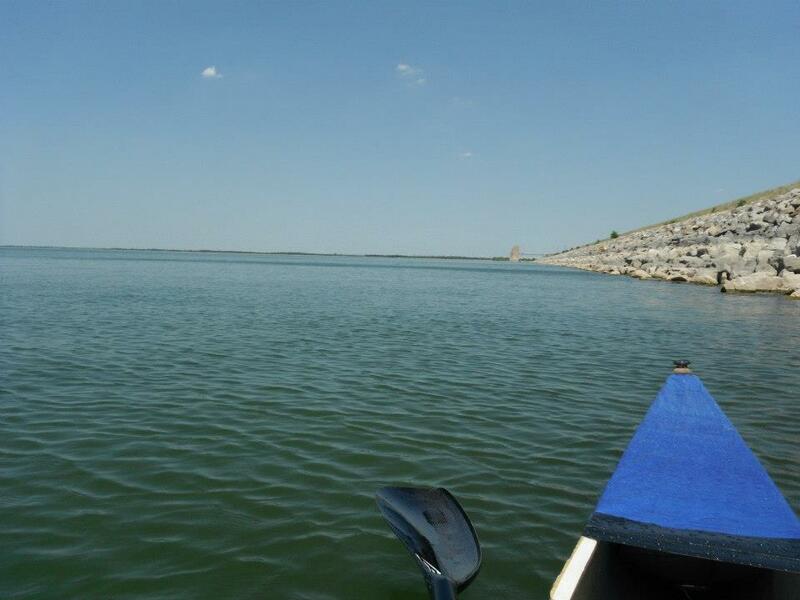 Generally at Lake Lewisville the winds come from the south, so paddling along the dam it almost always looks like this. I took the picture not because I always marvel at the expanse of calm water stretching out before me, but also because I like that you can just barely see my destination out on the horizon, with the dam stretching out to an undefined spot next to it. I get the same feeling when I can see a bridge or structure in distance. I know that’s where I’m headed, and it seems so far away, but I’ll get there eventually. It’s far and away my favorite feeling when I’m on the water. A lot of times when I’m paddling really hard I’m thinking about how this effort will pay off on the river. I wonder how I will stack up against other paddlers. A lot of times I’m just thinking about my form. But paddling just for the sake of getting to the next destination is when I am at my most content. It is its own reason to paddle. Question: Am I going about this all wrong? I realized very quickly I might have the wrong philosophy in my training. Obviously I need to be physically prepared, but I kept remembering the “First Rule of Finishing the MR340,” which is STAY IN THE BOAT. Read the comments on rivermiles.com for an hour, and you will probably see this advise from veterans given to novices three or four times. Stay in the boat. You have a current. Even if you aren’t paddling, you are moving. If you are on land you are dead in the water (so to speak) but if you are on the water you can finish. So… I changed my M.O. and decided that I would go for time in the seat, rather than mileage. I was going to push myself, but if I needed a break I would take one. If I needed to eat something, or filter water , or take a picture, or talk to another paddler I would do it, but I would do it in the boat. Question: Who is running the show here? The combination of going to bed the night before at 9:00, and my less than comfortable sleeping conditions, had me on the water much earlier than I anticipated on day two. Right off the bat the weather conditions were concerning but not terribly so. I figured as the day warmed up the wind would die off, and by two I should be headed north to the toll bridge that loomed about four miles away. In the meantime, I would ride the wind into Little Elm. It was when I made it to the end of that branch that my troubles began. I learned that running the show means you also have to deal with everything that’s thrown at you. It was almost noon, and the wind wasn’t letting up. In fact I was looking at cloud cover that could spell trouble. I turned around and it was wind full in my face all the way to the Little Elm bridge several miles away. One of the worst parts about wind is how you are never sure what direction it’s coming from. If you are on the south shore you think it’s blowing from the northwest. If you are on the north shore you think it’s blowing from the southwest. You can’t ever get any cover, and if you don’t read it right you will wear yourself out going back and forth trying to find it. After crossing the arm I was on three times, I realized I had not only judged it wrong, and was very, very worn out, but I was on the wrong side if I was going to get back to the marina where I started the day. My other option was to stay on the north shore and turn right. I would keep heading north, hope the wind would eventually let up, and cross at the toll bridge and be home by 6 or 7 pm. It would probably be a 25 mile day. It was at this point that I found I knew the answer to another unasked question. Do I know the layout of the lake well enough to properly navigate in a situation like this? Apparently I do. I didn’t need to pull out my map once. 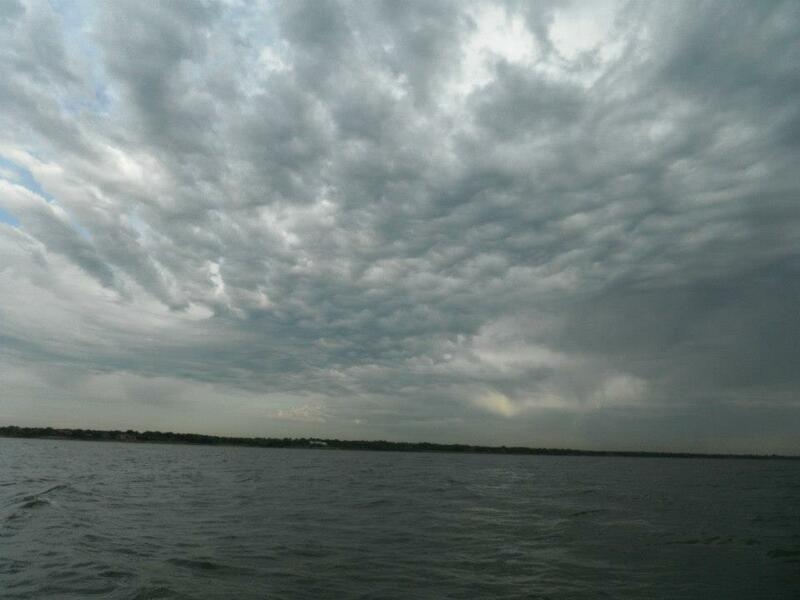 I made the decision to cross to the south and get back to the marina, where there was cover from the wind. I also knew I could get help there if I needed it. I made the crossing, paddling non-stop. I don’t know how I wasn’t completely physically exhausted by this point. Adrenaline and beef stew out of the can seemed to be working! After making it across I was forced to turn to the east, with the wind coming at me now from behind. It was at this point I was forced to admit that, even though I was running the show, things were out of my control. The boat was being almost continually turned sideways and then swamped with water. With my destination seemingly just around the bend I found myself floating next to a completely full canoe. Stay in the boat indeed! I swam, emptied my boat of both equipment and water, and called Matt, my room mate on my nearly dead phone. Luckily I didn’t need the shore patrol to come get me, which was my first inclination since I didn’t know exactly how far away from civilization I was. Conclusion: Let’s call it a learning experience. I learned a lot over those two days. I finally feel comfortable giving instruction to Tim and Steve Murray, my ground crew, regarding what I will and will not need during the race. I found out that my seating position, along with too much trail mix gives me indigestion. I learned it’s better to bring your pee bottle into the tent with you, so you don’t have to go outside three or four times in the middle of the night. But most importantly I realized I have all the tools I will need to finish this race, as long as I stay in the boat. July can’t get here soon enough. This entry was posted in Canoe, Getting ready for the race, The MR340, Uncategorized and tagged canoe race, kayak, Missouri River 340, MR340. Bookmark the permalink. This is from a racer last year and he wrote about finding the flow and talked with people about the race. I was online – Rivermiles forum! Time to TRAIN!!! Enjoyed this post. 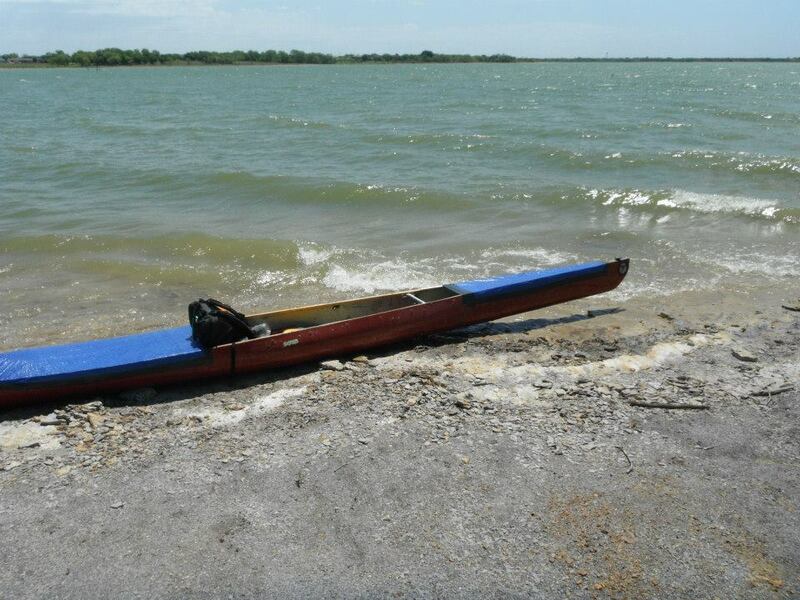 My paddling partner and I are in the final weeks of preparing for the Texas Water Safari in June. I would love to do the MR 340 in the future. Your advice is also good for the TWS … stay in the boat and keep paddling! Wishing you a good run on the MR340. Look forward to reading your follow-up posts. Omar, good luck on the TWS. If you’re ever in Dallas let us know. We’d love to meet ya. By the way, will you have a GPS so that we can follow your progress? Thanks. Yes, I will put a SpotTracker link on my blog on June 7, the day before the race. The link will go active on June 8 at 9:00 AM, the start of the race.